Need some inspiration for keeping up with your New Year’s Resolution? Check out these winners of the City of La Porte’s employee 18-week weight loss challenge called “Winning at Losing.” The program concluded with staggering results. A total of 677.5 pounds were lost! That equates to 13.5 pounds per participant or a loss of 5.94% of the total starting weight! Prizes were awarded to the winning teams and individuals. Three La Porte Police officers shared the most recent Employee of the Quarter award after they heroically pulled an elderly woman from the bay, after the boat she was in capsized. Discovering she was unresponsive, they performed CPR in perilous conditions, ultimately saving her life. CPR Classes •	January 19 - Heartsaver (HS) •	February 16 - BLS for the Health Care Provider (HCP) •	March 2 - HeartSaver (HS) Heart Saver is a CPR Class for anyone in the community who would like to be CPR certified. Health Care Provider is a CPR class for anyone in the community that works in the health care field Call 281-471-9244 to register. Cost is $23 for HS and $27 for HCP. Car Seat Check • January 3, 17 and 31 • February 14 and 28 • March 14 and 28 Have a certified Car Seat Tech install your car seat. Call Lt. Rachel Gomez 281-471-0073 to make appointment. Shot Clinic • January 12th • February 9th • March 16th LPEMS offers childhood immunizations for uninsured or under insured children from birth through 18 years of age. Please bring shot record. No appointment needed. Time is 9:00am - Noon. Call 281-471-9244 for more info. On November 8th, 2018 Interim Chief Ron Parker was sworn in as the Chief of Police. Chief Parker was selected as the top candidate, following Chief Ken Adcox’s retirement in August. 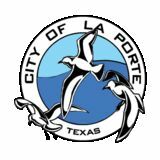 City Manager, Corby Alexander, made the formal and well-received announcement of Ron Parker as the new City of La Porte Police Chief. Ron Parker joined the La Porte Police Department’s patrol division in 1984 and was assigned to Detective in 1986 where he distinguished himself as a criminal investigator in Crimes against Persons and Child Abuse. In 1991, he promoted to Sergeant and supervised a patrol shift, where he earned the Medal of Meritorious Service and the Medal of Valor. In 1997, Ron promoted to Lieutenant and was assigned as a watch commander. He was transferred to the Support Services Division in 2000 as commanding officer. In 2008, Parker was appointed as Assistant Chief and in August, he was named Interim Chief of Police. He has received a number of commendations, medals and various awards. He was recognized as the City of La Porte’s Employee of the Quarter, Employee of the Year, and has been recognized as Manager of the Year several times. He has been recognized by the Texas House of Representatives by Special Resolution for his special contributions to law enforcement and public service. Parker currently serves as an assessor for the Texas Police Chiefs Association and is active in the community. He is a member of the National Domestic Preparedness Coalition, and serves as a volunteer with the Chamber of Commerce and the school district, and he is on the board of directors for the La Porte Education Foundation. He holds several degrees including an Associates in Engineering Technology, an Associates in Criminal Justice, a Bachelors in Criminal Justice Administration and a Masters in Criminal Justice Leadership and Management. He has also completed the Leadership Command College, the FBI Executive Leadership Course, the Command Staff Leadership Course and the Certified Public Manager’s Program at the William P. Hobby School for Public Policy. Parker is a Leadership Fellow with the Texas Municipal League, and has been published by the Texas Historical Society. He is also a veteran of the United States Army. Ron is married to his wife of thirty eight years, the former Debra Diamond, of Houston, Texas. They have two grown children, a son and daughter, and three grandchildren. Ron and Debra are La Porte residents and are members of the First United Methodist Church of La Porte, Texas. On October 24th, 2018, Lieutenant Matt Daeumer was promoted to Assistant Police Chief. Daeumer is currently assigned as the Assistant Chief of the Support Services Division. Matt has served the community with the La Porte Police Department since 1987, with a background of duties and assignments in all areas of the Department, making him a well-rounded leader. Matt leads members of the Police Area Representative Division, the Communications and Records Division, and the Animal Adoption Center. Matt’s other duties include system administrator for the Department’s computer-assisted dispatch and records management system, program manager for Texas Police Chief ’s Best Practices Recognition Program and Custodian of Records for the Department. Come and enjoy a book with us! Come to Brookglen Park at 10:30am the second Wednesday of each month beginning in January and running through May. Each week will be a different story with a craft to follow. Come out and enjoy a great childrenâ&#x20AC;&#x2122;s story and a fun time together. Bring along your lunch and enjoy our parks afterwards. For more information or questions call the Parks and Recreation Department at 281-470-7275. Spring Break is just around the corner! Be on the lookout for our Camp Jamboree registration. Camp will take place March 11th â&#x20AC;&#x201C; 15th at the Evelyn Kennedy Civic Center. We have games, crafts and trips planned to keep the kids engaged and active during their days off. The cost is $60 per kid. For more information or questions call the Parks and Recreation Department at 281-470-7275. Looking for a summer job? Look no further! Check the City website at LAPORTETX.GOV/JOBS for a listing of all summer jobs the Parks and Recreation Department has to offer. There are numerous lifeguard positions available, and the city provides certification opportunities. For more information or questions call City of La Porte Human Resources at 281-470-5028. Retired life is thriving at the Norman L. Malone Senior Center. Discover all of the daily fun activities and programs inside the Parks & Recreation Program Guide, Fun Times By The Bay! Discover all the exciting programs and events available throughout the Parks & Recreation Department. 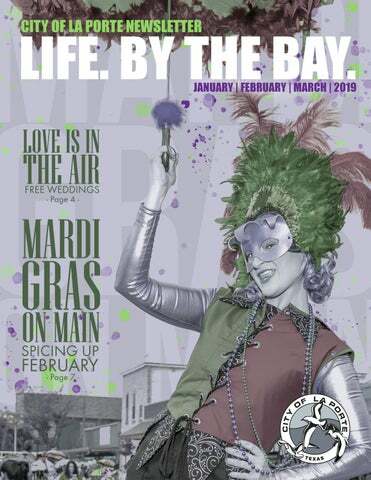 The program catalog is available online at laportetx.gov/funtimesbythebay! ouncilwoman Dorothy â&#x20AC;&#x153;Dottieâ&#x20AC;? Kaminski passed to her eternal resting place on October 1, 2018. Dottie was a life time resident and beloved member of the La Porte community. Her dedication to the community was displayed in her long-standing civic and community involvement. She served as Councilmember for 7 years, on the Planning and Zoning Commission for over 21 years, and was an active volunteer member of the La Porte Bayshore Chamber of Commerce for 17 years, which includes 6 years on the Board of Directors and 15 years as Chairwoman of the Sylvan Beach Festival. Dottie also served on the Economic Development Board and the Small Business Board for over 6 years. She was presented with the Gus Groos Humanitarian Award in 2007 and was honored as the runner up finalist for the Public Official of the Year Award in 2014. She co-founded the La Porte Boys Baseball, La Porte Oilers Football (now the La Porte Texans), the La Porte Education Foundation, and the La Porte High School Football Booster, as well as served with each organization for numerous years. Her love for the community was only surpassed by her love for her family. Dottie raised two sons with her husband Jimmie and was proud to watch her four grandchildren grow up in the La Porte school system. The impact of her deeds and contributions to our community will be felt for generations to come. Though her absence leaves a significant void and sadness, we reflect on the positive role she played in the life of our city and the impact she has made on the citizens of La Porte.